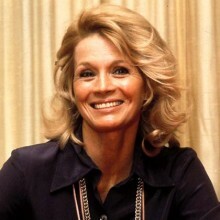 One of the first women to star in her own dramatic television series, Angie Dickinson is known to millions for her portrayal of Pepper Anderson in the television drama, “Police Woman.” Having starred in numerous major motion pictures and mini-series, it was director Howard Hawks who discovered her and gave her the female lead in “Rio Bravo” opposite John Wayne. Since then, she has appeared in “Ocean’s Eleven” with Frank Sinatra, Dean Martin and Sammy Davis, Jr.; “The Chase” with Marlon Brando and Robert Redford; and “Sabrina” with Harrison Ford, to name a few. Her most recent role was in the film “Duets” opposite Gwyneth Paltrow. Off-screen, however, Dickinson has become a leading advocate for issues concerning Alzheimer’s Disease. Her sister’s battle with the disease has resulted in Dickinson becoming a knowledgeable speaker on the disease’s many stages. She is a popular guest on television talk shows and has appeared frequently across the country and on “Larry King Live” as an activist on behalf of Alzheimer’s education and awareness. She is a moving speaker, and her presentation on living with a loved one that has a debilitating or life-threatening illness is both heartfelt and profound. Do you want to hire Angie Dickinson? Directly request a quote. In 48 hours we can send you the availability of Angie Dickinson If you would like to book Angie Dickinson, Entertainment Booking Agency is the right place. We will offer you the best price and contact the management or we directly contact Angie Dickinson. For corporate appearances or speaking engagements you can contact our agents and the will help you true the process. Tags: hire Angie Dickinson, Angie Dickinson booking, book Angie Dickinson, Angie Dickinson appearances, find more information on booking Angie Dickinson for appearances, Angie Dickinson speaking engagements, Angie Dickinson endorsements/spokesperson, Angie Dickinson appearance fees, Angie Dickinson booking agency contact info, biography of Angie Dickinson, Contact an artist booking talent agent find a speakers bureau that can book Angie Dickinson, speaker booking agency for Angie Dickinson, Angie Dickinson booking agency, Angie Dickinson booking for corporate event. EBA is one of the biggest entertainment booking agencies in the World. We book hundreds of celebrities, artist, athletes and speakers in a year. Important to know is that we are not claiming to be the management of Angie Dickinson. We are not the official agent for Angie Dickinson. Companies from around the globe book these artists and speakers true our company be course we have one of the biggest networks and we always have direct contact with the artist or the management. We help you to find the right celebrities for your corporate of private events. Please contact one of our agents to get free advice and we will help to get the world-famous artist on your party.